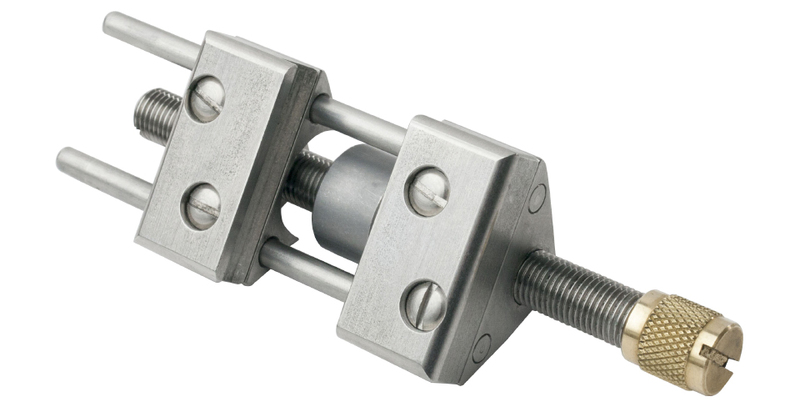 Our version of the side clamping style of honing guide is solidly machined from Stainless Steel, with a Bronze bearing. 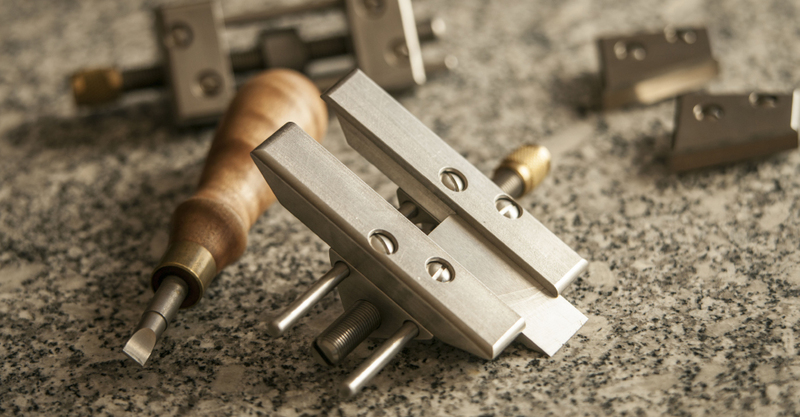 The Honing Guide features removable jaws: it comes with a standard pair of jaws that fit most of our blades, and additional jaws are available for Chisels 3/16" and under, tall jaws for Mortise Chisels, long jaws for very short blades and angled jaws for Skew Blades. We have designed these jaws for our blades and chisels, not other makers'. For information on angle setting, click on the "Use" tab above. The Standard Jaws (included with the Honing Guide) fit most of our plane blades, as well as our 1/4" to 1" Bevel Edge Chisels. The Chisel Jaws fit our 1/8" and 3/16" Bevel Edge Chisels (as well as our 1/4" to 3/4" Bevel Edge Chisels). The Mortise Chisel Jaws fit all of our Mortise Chisels except the 1/10". The Long Jaws fit blades for all of our Spokeshaves and for the following Lie-Nielsen planes: No. 610, 10-1/4, 041, 042, 073, 101, 100, and 1/2. These jaws are reversible. The short end hones a bevel up to 40° and the long end hones a bevel up to 30°. The 18° Skewed Jaws fit our No. 140 Skew Block Plane (left or right hand). The blade for the left hand No. 140 fits with the left skewed jaws, and the blade for the right hand No. 140 fits with the right skewed jaws. The 30° Skewed Jaws fit our No. 98/99 Side Rabbet Planes (left or right hand). The blade for the No. 98 fits with the right skewed jaws, and the blade for the No. 99 fits with the left skewed jaws. For more information about sharpening, download our Sharpening Instructions PDF and Deneb Puchalski's Angle Setting Jig PDF. 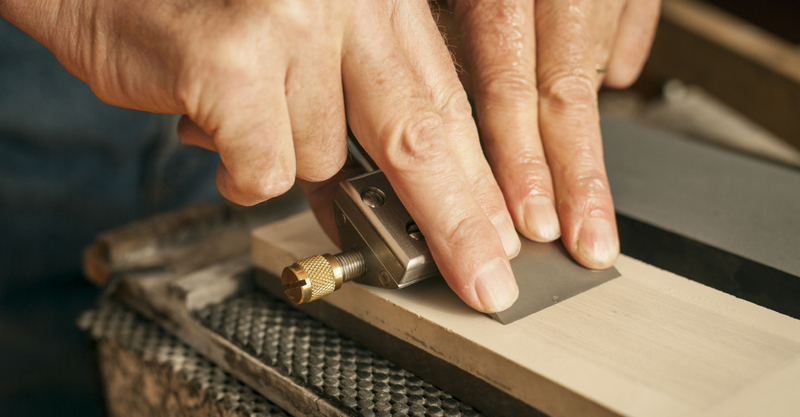 When using the Mortise Chisel jaws, add 5 degrees. 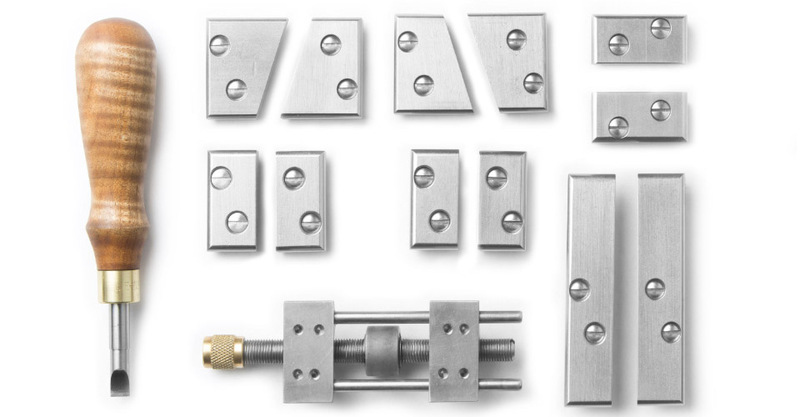 All parts are Stainless Steel, Brass, or Bronze. Keep the threads free of grit by rinsing off with water after use, but wipe off excess. If you want to oil the threads, use a light machine oil. This is not necessary. All parts are replaceable and available from us. To disassemble, use two screwdrivers to remove the Brass nut. The Brass nut is reverse-threaded. Unthread the threaded rod from the body, remove one retaining clip to remove the roller bushing assembly. Reassemble in reverse order.